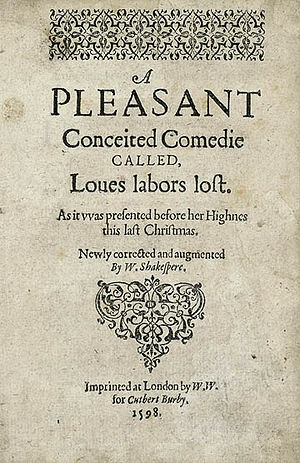 Love's Labour's Lost is a comedy play by William Shakespeare which was written between 1588 and 1597. Ferdinand, the King of Navarre, and three of his men meet together and talk about their intellectual plans. Their plans then go wrong when the Princess of France and three of her ladies arrive. The men find that they are in love with the ladies and cannot hide it. This page was last changed on 4 July 2013, at 09:47.